For the history of Batman, check out this post. 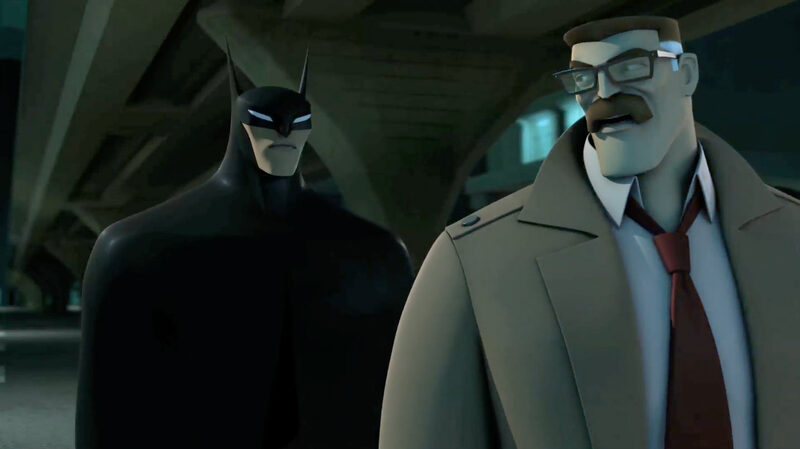 At the 2010 San Diego Comic Con, it was announced that Batman: The Brave and the Bold would be ending after three seasons in order to make way for a new Batman series that would return the character to a more serious and dark tone. 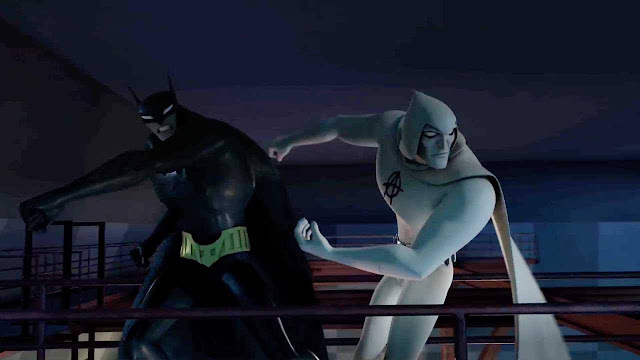 Introduced as Beware the Batman, it would be the first time a Batman series was rendered completely in computer animation, and the second DC Comics series overall after Green Lantern: The Animated Series. The early promo image that had fans in a tizzy over Alfred's portrayal. The series was set during Batman’s (Anthony Ruivivar) early years. Unlike previous series, his faithful butler Alfred (J.B. Blanc) took a more active role in Batman’s activities; helping to train him and occasionally joining him on missions, playing up his past as a British operative in MI-6. Early promotional imagery for the series played up this fact by showing a gun-wielding Alfred alongside Batman, which sparked some protests from fans especially regarding Batman’s stance on guns. Producer Glen Murakami explained it was intended as an action shot of the principal characters and that Alfred’s role in it was exaggerated. This version of Alfred was inspired by Jim Malone (Sean Connery) from The Untouchables. James Gordon (Kurtwood Smith) also appeared as a reluctant ally of Batman who eventually warmed up to him. He began the series as lieutenant, but ended up as commissioner when his predecessor was killed. When Alfred was hurt in an episode, he decided to contact an old associate of his to act as a bodyguard for Bruce Wayne and partner for Batman: Tatsu Yamashiro, aka Katana (Sumalee Montano). 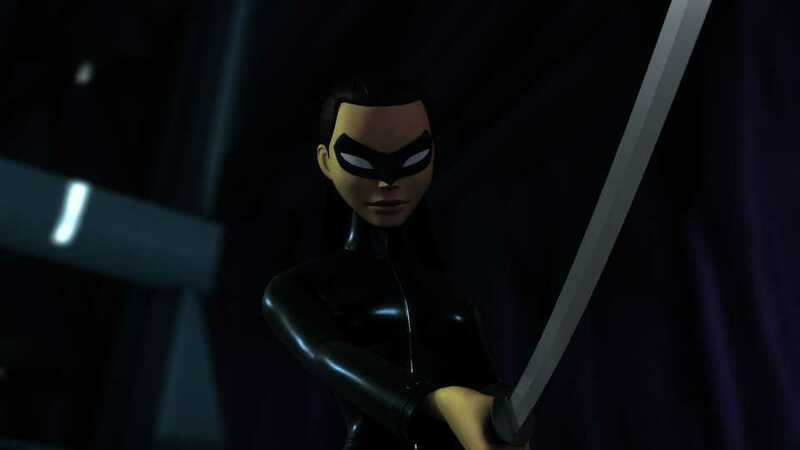 Katana had first appeared on television in the previous Batman series, and had worked alongside him in the comics as a member of the team called The Outsiders. This version of Katana was a CIA agent who had infiltrated the League of Assassins to take the Soultaker Sword, her customary weapon that absorbed the souls of whomever it killed, from their possession. Katana was essentially a stand-in for Batman’s customary partner, Robin. 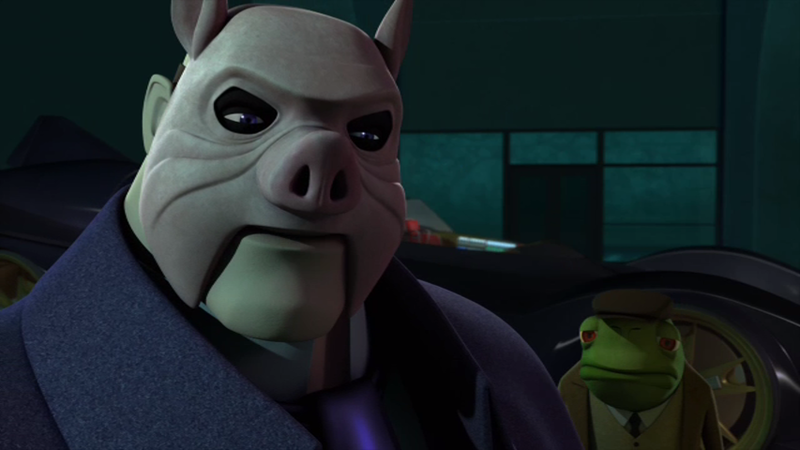 Professor Pyg and Mister Toad make their animated debut. Another difference from previous shows was the rogue’s gallery utilized. Producer Sam Register explained Warner Bros. didn’t want to retell the same old stories, and as a result the production team went deep into the villain library to pull out some new foes for Batman to face; some for the first time outside of comics. Amongst them were two of the newest villains that debuted during Grant Morrison’s Batman and Robin comic run: Professor Pyg (Brian George) and his associate Mister Toad (Udo Kier). Pyg was toned down from his psychologically deranged and violent tendencies and remade into an eco-terrorist who targeted wealthy businesspeople who participated in shady dealings. Toad was likewise toned down, given a wooden cane with a flamethrower and a sonic croak. 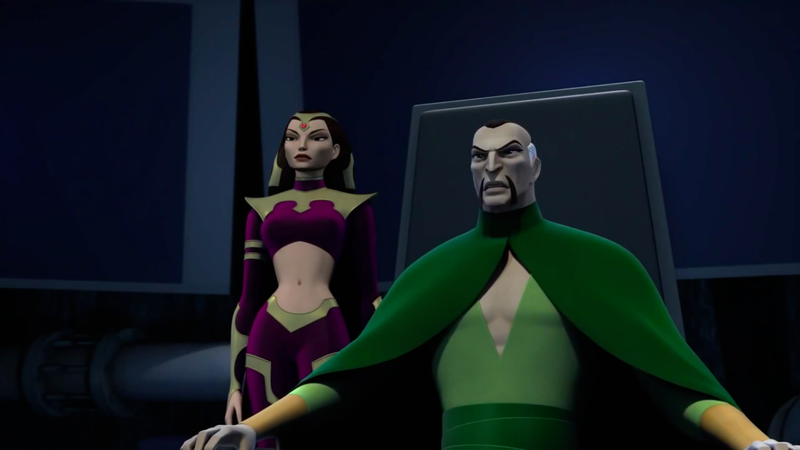 Making their television debut were the characters of Anarky (Wallace Langham), a madman and self-proclaimed champion of chaos who took the Joker’s place as Batman’s primary foil; Magpie (Grey DeLisle-Griffin), replacing Catwoman as the criminal romantically interested in Batman, was a kleptomaniac who underwent an experiment resulting in her being unable to feel pain and could grow poisonous claws from her nails; Junkyard Dog (Carlos Alazraqui) and Daedalus Boch (known as Doodlebug in the comics, played by Arif S. Kinchen), a pair of street vandals; Humpty Dumpty (Matt L. Jones), a former mob accountant who developed a childlike personality after surviving a missile attack and used toy soldiers with real weapons; Cypher, an agent of the League of Assassins reimagined as a cyborg who was able to control people by jacking into them via wires; and Tobias Whale (Michael-Leon Wooley), an albino crime boss who was assisted by his lawyer, Phosphorus Rex (Greg Ellis) who could attack with fire. Ra's Al Ghul and Lady Shiva. 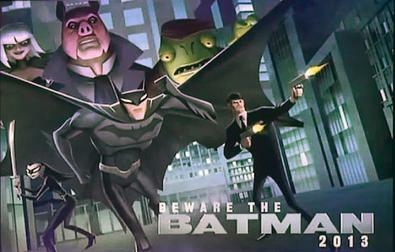 Previously depicted foes included the crocodile-like criminal Killer Croc (Wade Williams); elite mercenary Deathstroke (Robin Atkin Downes); district attorney Harvey Dent who was placed in charge of an anti-Batman tactical squad until a facial injury turned him into Two-Face (Christopher McDonald); the scientist-turned-human-bat Man-Bat (also Downes); The Key (Blanc), an old shopkeeper who could mold his fingers into a key to fit any lock; elite assassin and martial artist Lady Shiva (Finola Hughes) who was depicted as a member of the League of Assassins; and the League’s leader Ra’s al Ghul (Lance Reddick), a criminal mastermind who discovered the secrets of longevity. 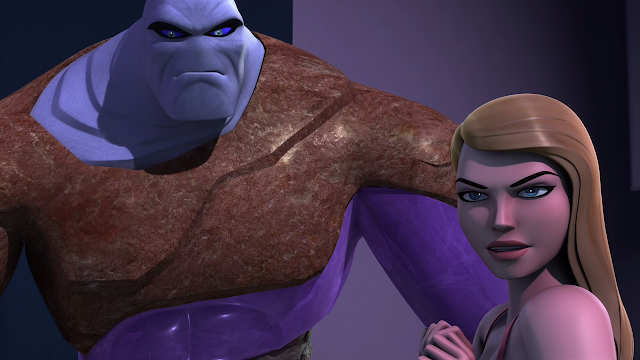 Other characters included Gordon’s daughter Barbara (Tara Strong, reprising the role from The New Batman Adventures), Michael Holt (Gary Anthony Williams) who appeared as a businessman rather than his alter-ego of Mister Terrific, security guard-turned-shape-shifting elemental Metamorpho (Adam Baldwin), head of Stagg Enterprises and creator of Metamorpho Simon Stagg (Jeff Bennett), and his daughter Sapphire Stagg (Emmanuelle Chirqui). The animation for the series was handled by India-based animation house Xentrix Studios. Because of the 3D animation, every object that appeared on screen needed to be built to completion. The development of full props and sets allowed them to play with camera angles and lighting as needed, offering up a cinematic quality. Murakami’s design team went so far as to create a cardboard replica of Batman’s utility belt in order to see how it would sit and move when worn. The characters were designed in a stylized fashion, although Batman was kept as real as possible while the villains were more over-the-top. The series debuted on July 13, 2013 as part of Cartoon Network’s DC Nation block; a block of programming featuring content based on DC Comics properties. The theme was composed by Dum Dum Girls. It was nominated for an Annie Award for “Best Animated TV/Broadcast Production for Children’s Audience” and the 2014 Daytime Emmy Award for ”Outstanding Children’s Animated Program,” “Outstanding Casting for an Animated Series or Special,” Outstanding Directing in an Animated Program,” and “Outstanding Main Title and Graphic Design.” It didn’t win in any of the categories. Is this the end of Batman? On Cartoon Network it is. Three months after the series premiered, the entire DC Nation was put on an unexplained hiatus by Cartoon Network on October 13, 2012 at the last minute. It was replaced by DreamWorks’ Dragons on Saturday and Johnny Test on Sunday. When the block eventually did return in 2013, it was only comprised of reruns of Teen Titans Go! and various shorts. It was rumored that DC felt humorless super hero programs no longer appealed to kids and therefore pulled the shows, likely due to the failings of the Green Lantern and Young Justice toy lines. Cartoon Network eventually declared the series a financial failure and decided to write it off. The series was moved to their Toonami block as part of their late-night Adult Swim showcase. On September 28, 2014, they ran a marathon of the final seven previously unaired episodes. Unlettered cover art from the comic. Concurrent with the series, DC published a digital comic set after the first season as a series of “episodes.” It was teased in the 2013 DC Nation Super Sampler made available on Free Comic Book Day. These were later printed in comic form beginning in October of 2013 with two episodes were included each issue for a total of six issues. McDonald’s produced six toys as a promotional tie-in to the series for their Happy Meals. 2013 also saw the release of a 6” Batman as part of the Batman Unlimited line, and a later 3.75” model labeled as simply “Batarang Battle Batman” by Mattel. 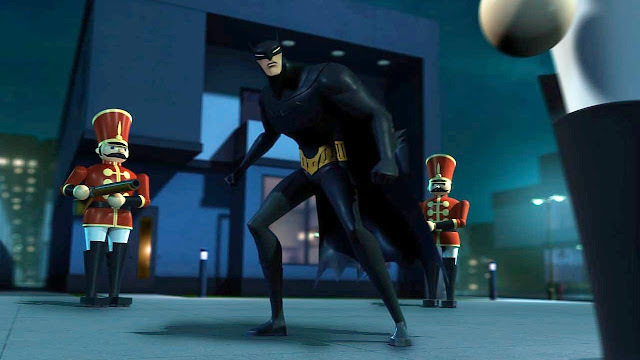 In February of 2014, the first 13 episodes were released to DVD and Blu-Ray on Beware the Batman: Season 1 Part 1 – Shadows of Gotham. At that point, the episodes “Attraction” and “Fall” had not yet been aired. 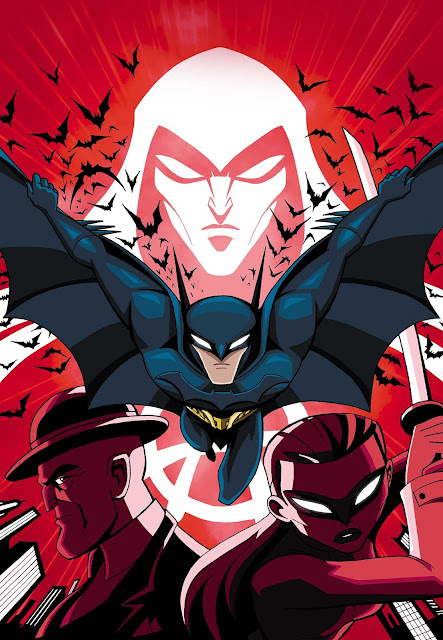 In September, the remainder of the series was released on a set called Season 1 Part 2 – Dark Justice. “Hunted” (7/13/13) – Professor Pyg and Mister Toad target Gotham’s resident billionaires while Alfred hires Bruce Wayne a new bodyguard, Tatsu Yamashiro. “Secrets” (7/20/13) – Chasing after Magpie puts Batman and James Gordon at odds with each other. “Tests” (7/27/13) – Anakry determines to prove himself Batman’s better by hiding his true game plan: the ultimate disaster seen by all of Gotham. “Safe” (8/3/13) – The League of Assassins targets Wayne Manor when Bruce unveils a device capable of ending the world’s energy crisis. “Broken” (8/10/13) – Humpty Dumpty tries to get revenge on his former employer Tobias Whale with an army of life-sized toy soldiers, and his first target is Gordon. “Toxic” (8/17/13) – After exposure to a toxic gas, Rex Mason begins to mutate uncontrollably. “Family” (9/7/13) – The League of Assassins kidnaps Bruce in order to force Katana to turn over the Soultaker Sword. “Allies” (9/14/13) – Releasing Tobias Whale from custody, Gordon’s daughter Barbara ends up kidnapped forcing Gordon to turn to Batman for help. “Control” (9/21/13) – Lady Shiva sends Cypher after Dr. Jason Burr to get the Ion Cortex, and attempts to stop him leads to Katana falling under Cypher’s control. “Sacrifice” (9/28/13) – Anarky frames Batman for his theft from the League of Assassins while sending Batman and Katana after Lady Shiva in the Gotham Contagion Research Center. “Instinct” (10/5/13) – Professor Pyg and Mister Toad return to wreak havoc on the fashion world. “Attraction” (7/27/14) – Batman has secretly been helping Magpie recover mentally, but she snaps when she becomes jealous after seeing Batman and Katana together. “Fall” (8/3/14) – Cypher has Burr steal the Ion Cortex for the League, putting Gotham in darkness, as Lady Shiva resurrects Ra’s al Ghul. “Darkness” (8/10/14) – Batman allies himself with Silver Monkey to escape the League while the others try to save the city from them and the results of the blackout. “Reckoning” (8/17/14) – Ra’s Al Ghul unites Batman’s villains against him in exchange for a piece of the city while the Gordons attempt to disable the Ion Cortex. “Nexus” (8/24/14) – Six months later, Gordon is named Police Commissioner and District Attorney Harvey Dent is put in charge of ridding Gotham of its costumed citizens. “Monsters” (9/7/14) – Batman and Katana team up with Rex to take down criminals supplied by Stagg Enterprises while evading Dent’s new Special Crimes Unit. “Games” (9/14/14) – Humpty Dumpty kidnaps Batman, Katana, Gordon, Whale and the Mayor and challenges them to a Murder Mystery Game to figure out the culprit amongst them. “Animal” (9/21/14) – Batman has himself sent to Blackgate Prison in order to find out where The Key hid the code-breaking software he stole. “Doppelganger” (9/28/14) – As Bruce befriends Dent and the captain of the SCU, Pyg and Toad create an army of mutant humans. “Unique” (9/28/14) – An old friend of Bruce’s comes to him for help after her father was cloned by The Council to make an army of super soldiers. “Hero” (9/28/14) – Dent allies himself with Anarky who recruits Deathstroke to the SCU to take down Batman. “Choices” (9/28/14) – Barbara has to save Batman and Katana from Killer Croc, but unfortunately she is on a date and being watched by two cops. “Epitaph” (9/28/14) – Bruce is “assassinated” by Batman at Dent’s mayoral campaign rally and stays dead long enough for the real Batman to investigate. “Twist” (9/28/14) – Blaming Batman for his failed bid to become mayor, Dent enforces martial law and demands Batman be brought to justice with extreme prejudice. “Alone” (9/28/14) – Deathstroke discovers the Batcave and takes Alfred hostage, while Dent becomes Two-Face and ends his partnership with Anarky.